Poppy is a little green wandering balloon. While floating along he sees his shadow. He doesn't understand it is his shadow. He believes he is being followed by a stranger. He floats to the woods and asks his friend the owl to help him. The owl sends him to the fox. The fox sends him to the snake. None of them see the stranger Poppy tells them about. The snake sends Poppy to the Bear who is the wisest of them all. The bear explains to him about his shadow. As Poppy floats over the water he takes the bears advice and drops closer and realizes he had nothing to fear. This is a cute book that teaches children not to fear what they don't understand. 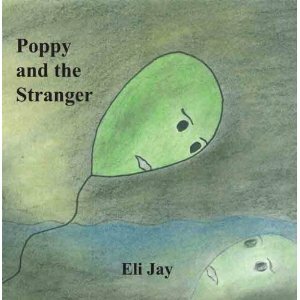 Eli Jay is the author of Poppy, The Wandering Balloon and Poppy and the Stranger. She is also a physician and a native of Washington, DC. It is here Eli lives with her family and continues to write, produce, and illustrate several Poppy adventures. Many of these adventures will live on through a delightful and intriguing children's series for decades come. Poppy is not only an adorable little green balloon, but he has also been described by many reviewers as the ultimate inner child within each one of us. Poppy is a character who happens to be a source of inspiration, hope and comfort to those big and small. And that is just what he will be to you and your family as you enter his world.